Stick V9 Max Kit are new kits of Stick V9 series, also the upgraded version of Stick V8 series. other. As for the tank, it has a gigantic e-liquid capacity with 8.5ml, and it’s specially designed for Stick V9 Max. SMOKTech Stick V9 Max Kit are new kits of Stick V9 series, also the upgraded version of Stick V8 series. focusing on lower wattage but intense clouds and flavor. Stick V9 series has debuted, and it’s better than ever. 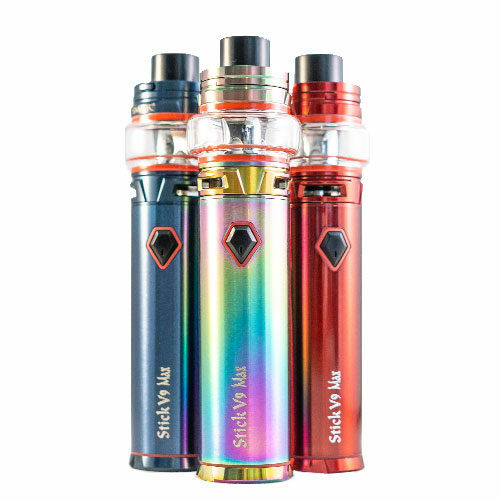 Stick V9 Max, SMOK’s latest pen-style vape with the largest battery capacity to date, has eye-catching outlook and excellent performance, making it stand out among stick series. Stick V9 Max is a power master that employs an unprecedented built-in 4000mAh battery to provide you powerful and durable vaping experiences. Stick V9 series has LED indicator to tell you the accurate conditions of itself. If pressing the Power Button twice in a row within one second, you’ll see the current battery power status. while TFV8 Baby V2 tank adopts convex glass tube — Bulb Pyrex Glass Tube #7, which can effectively enlarge the e-liquid capacity. There’s no need to add the e-liquid frequently, and you can enjoy vaping at ease.